When he was granted the Congo Free State through the 1885 Berlin Conference, King Leopold II made history as the first individual to control a new colony. His reign resulted in two decades of bloody violence before public pressure forced Leopold to step aside, and the Congo was annexed as a colony of Belgium. History books and popular literature often depict this era as one of the great travesties of humanity — yet another time when Europeans seized control of an indigenous population and seemingly destroyed their way of life. Books like “Heart of Darkness” by Joseph Conrad or “King Leopold’s Ghost: A Story of Greed, Terror and Heroism in Colonial Africa” by Adam Hochschild reflect the themes of abuse and hopelessness. Through case studies of Congolese art in various mediums, she hopes to add more complete information to the narrative of this turbulent time in the Congo’s history. As Belgium sought to assert its control, it was not unheard of for government officials to appoint new chiefs in Congolese villages. This new chief was typically someone who became familiar to the Belgians either through trade or as a guide and offered a convenient way for them to have control, according to Forbes. “There’s a long history, going back to at least the 15th century, of using raffia mats as a status marker,” Forbes says. “When a new leader came to power, one thing that he could do to try to legitimize his authority was to draw upon this long-standing practice of displaying raffia. Because the Belgians were appointing people who may not have come from a long lineage of chiefs, these individuals had to do things to assert their authority. Raffia was one way of doing this. Since the 15th Century, the Congolese have created and displayed raffia mats as symbols of status. 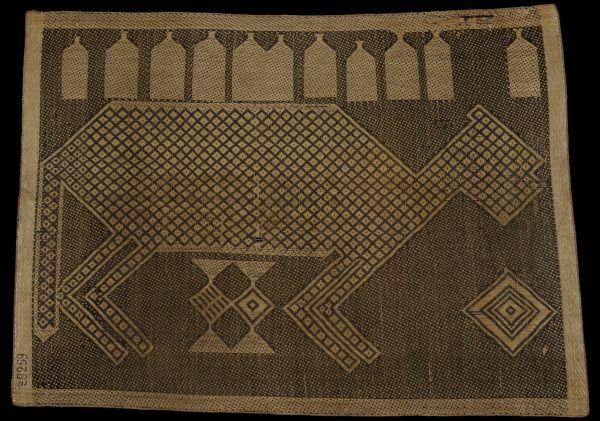 The leopard on this mat represents the ability to move between both the human and spiritual realms — a sign of power, according to the people of the Congo. Photo by J.-M. Vandyck. Raffia Mat. Kongo artist. Early 20th century. Collection RMCA Tervuren, EO.0.0.29259. Whereas the display of raffia has a long history, the use of figurative motifs (rather than geometric abstract patterns) on the mats is an innovation of from the late 19th and early 20th century. This mat shows a leopard and some bottles. Regalia with leopard claws or skin represented status. “There was a long-standing believe that the leopard could move between spiritual realms and realms of the living,” Forbes says. Adorning himself in leopard regalia allowed the chief to show he had the affirmations of the spirits. “Having an animal that encompasses all of that on a raffia mat was just another way to show status, and show that this leader knows how to connect to this culture.” Images of bottles are prevalent from this time period as well. Forbes talks about “wonderful” photographs of chiefs surrounded by trade bottles, like gin, which was a sign of contact with Europeans. It was their way of saying I am wealthy, I am powerful, and I’m a leader, according to Forbes. The Royal Museum for Central Africa in Tervuren, Belgium, has the largest collection of Congolese art in the world. Forbes spent six weeks this past summer working and conducting research there. Since the museum is undergoing a major renovation, Forbes assisted with the redesign of exhibits, which included editing text and citations. Despite being roughly 4,000 miles from Europe, to say that colonial Congo was completely cut off from the rest of the world is not accurate. In contrast to the imagery presented by Joseph Conrad, a Congolese artist by the name of Paul Mapinda produced watercolor paintings that replicate images from European fashion magazines. The influence of European culture is evident in some of the artwork from the Congo. This watercolor painting produced by Paul Mapinda replicates images from European fashion magazines. Mapinda, Paul (Congolese). Untitled watercolor. 1931. Collection RMCA Tervuren, HO.0.1.3418. 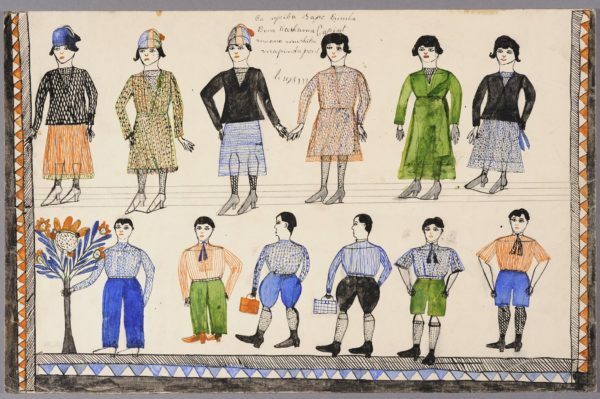 There is still a lot of work to be done to confirm who these artists were, who commissioned these pieces, and how these objects might have come into museum collections, but they offer valuable insight into the lives of these artists, according to Forbes. Forbes is applying for research grants to go to Congo for an extended period of time — nine months to a year. While much of colonial Congolese art resides in museum collections in Belgium, Forbes says there may still be pieces to explore in Africa. 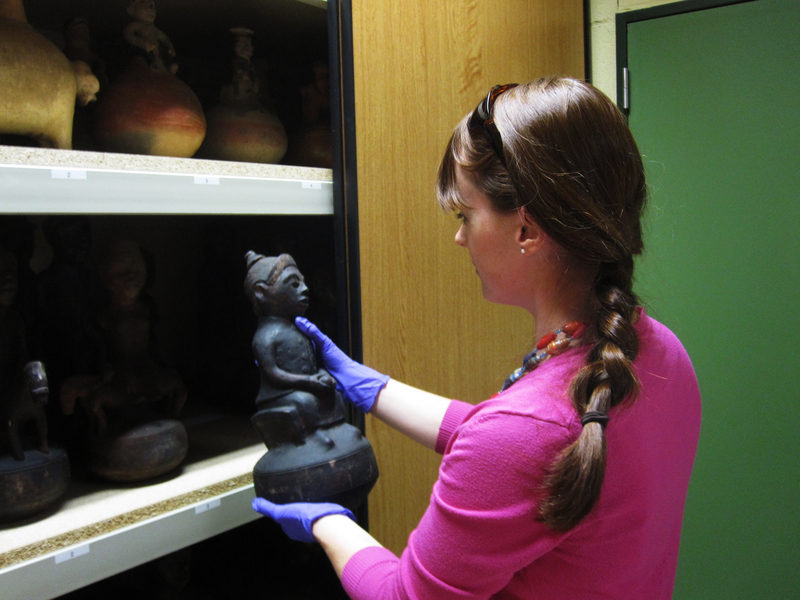 “It’s rather disorganized in terms of where things are and how well they’re preserved and whether or not there is anything left there.” But, she knows of several collections that have some colonial-era objects, and she wants to go there, examine these examples, and try to find artifacts that haven’t been discussed in past scholarship. Forbes has been in contact with several former missionaries who worked in Congo during the 1960s. Some of these missions have archives, and one in particular has a very well preserved archive that the local community is determined to keep in Africa — not send to Belgium, according to Forbes. When Forbes discusses her research, she talks a lot about collective memory. In the 1980s, some art history scholars argued that because these pieces of Congolese artwork were sent directly to Belgium, the Congolese forgot about them. “After decades in storage, these works were ‘rediscovered’ in the 1980s,” Forbes says. “So there’s an argument that they don’t have a legacy in Congo because no one remembers them.” But some contemporary Congolese artists look back at these pieces and consider them part of their heritage, according to Forbes. “A big question that the Congo — and Belgium, too — is trying to work through is how does colonial memory persist today?” Forbes says. “What are its effects? How do we work with that memory? Whether it’s working through the trauma or working through the problems its created and its legacies, Forbes wants to better understand it to move the dialogue forward. Carlee Forbes is a PhD candidate in the Art History Program in the Department of Art in the UNC College of Arts & Sciences.